If you are not a super big fan of asparagus, you might still enjoy cheesy grilled asparagus. 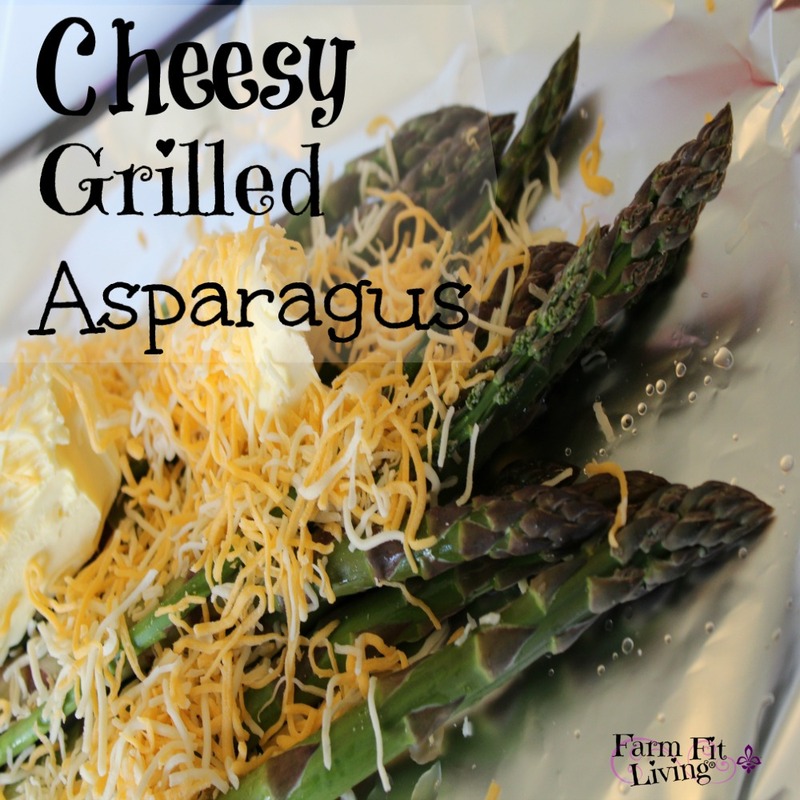 Cheesy grilled asparagus is a yummy way to eat that yummy green spring veggie. I think I love it so much because it is one of the very first vegetables of spring. Each spring when the stalks grow and the head emerges, I start craving asparagus. It’s just one of those seasonal cravings. After a couple of weeks, that craving is gone and it doesn’t taste good anymore. Asparagus is good to eat any time of the day. For breakfast, I add it to scrambled eggs. It’s delicious for lunch and supper paired with farm fresh meats. You can also eat it raw for a snack. Asparagus is nutritious. You are probably aware of this already, right? But how nutritious is asparagus? One exciting thing about asparagus nutrition is that it contains high amounts of fiber and folic acid. It’s also known to fight cancer and is loaded with antioxidants to keep us healthy. Ok, now for the fun part. Let’s add a grill, butter, cheese and seasonings to the equation. Are you ready? Strip a large rectangle of tinfoil from the box. It should be large enough to completely cover the asparagus and make an enclosed packet. Lay asparagus evenly on the tinfoil. Add the good stuff. Butter, shredded cheese, seasonings. As much as you want! Wrap the tin foil to make a packet. Just like wrapping a present. The main thing here is to make sure nothing will spill out of the packet. Place the packets onto the grill for several minutes. The cheese will be melted and asparagus will be soft. The easiest way to start asparagus is by obtaining crowns from a local greenhouse or grower. In my zone (6), it’s best to plant new asparagus crowns in March to April. Care of asparagus plants includes weed control. Mulching with straw or leaves is a great organic practice for weed control. Finally, the asparagus is ready to harvest when the spears are 5 to 10 inches long. Be sure to wash the spears before you enjoy. Spears should be refrigerated until eaten. They can also be preserved: Frozen or canned. 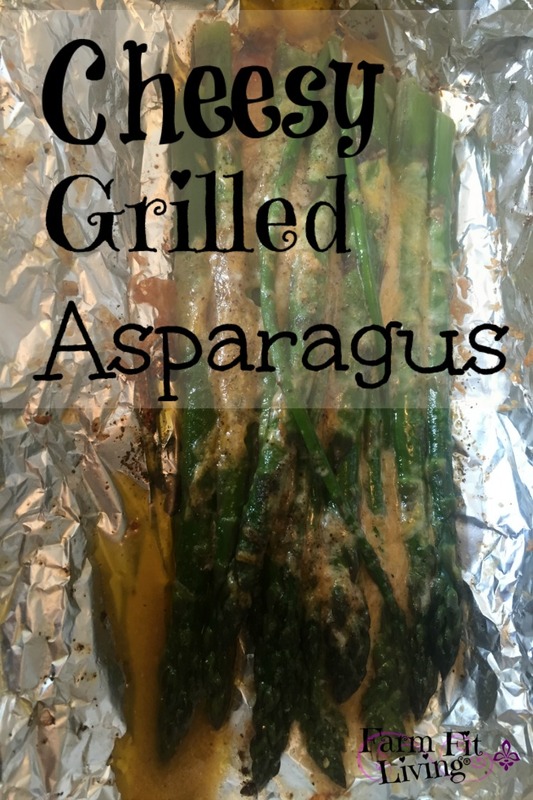 Enjoy Your Cheesy Grilled Asparagus! I hope you find cheesy grilled asparagus to be delicious. Please let me know if you love this recipe. Comment below or find me on Facebook. Our asparagus is just starting to come up like crazy! 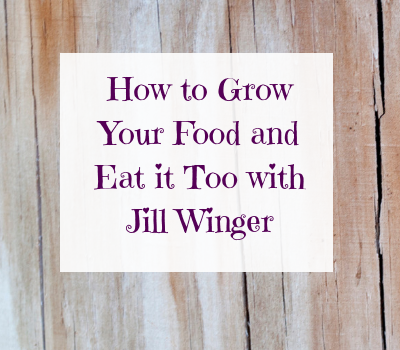 I’m always on the lookout for different ways to prepare it, especially ones that our toddler will like! Thanks for sharing! My toddler loves it, Lisa. She gobbles it right up every time. 🙂 Another way we like to prepare it is chopped up into scrambled eggs. It’s delicious, too. my husband puts cheese on everything, so i’ll definitely have to try this next time we make asparagus! Cheese makes everything better, doesn’t it? Thanks! Kids love it, too.